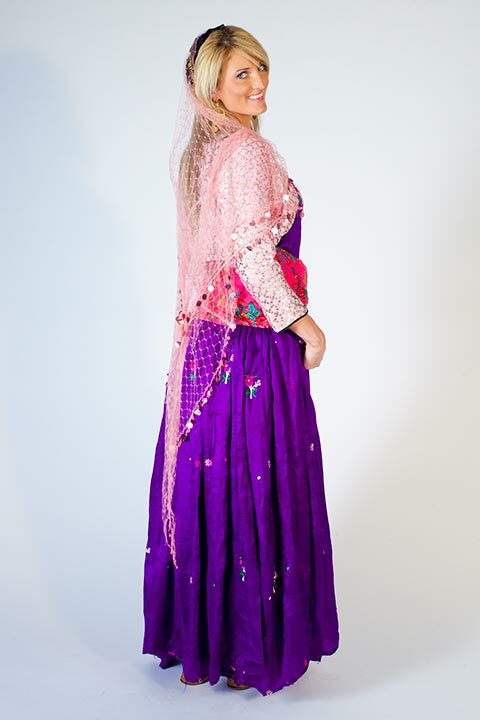 This costume is owned by Azita Tataei, and was worn by her mother Pari Nikdin for her wedding circa 1960. Worn in the 1950s, original wedding dress. Baggy trousers (Darpe) are worn under the dress (Krass). The trousers are made from any thick fabric, printed or plain and would not be visible under the dress. The krass is made from 4-5 metres of hand stitched silk. The pleated skirt is made from 3 metres of fabric. The belt is made from a fabric called pashmina and is approximately 4 meters long. 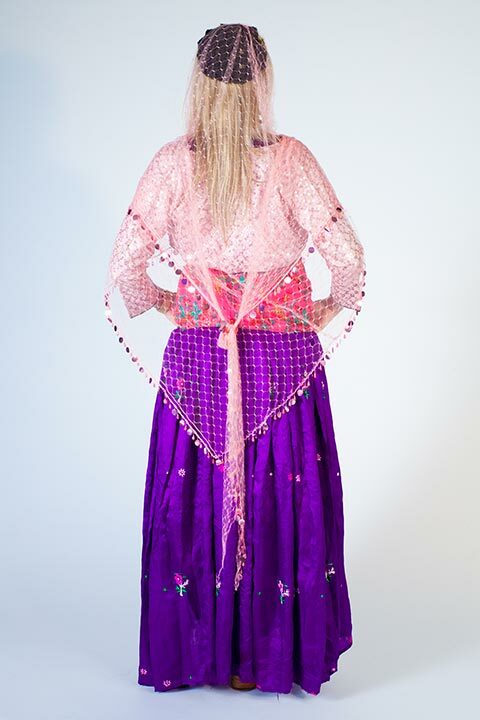 The little jacket (Salta) is made from a thick cotton and is embroidered with coloured sequins. The shawl (dassmal) is a triangle shape and made of a fine net fabric. The edges are embroidered with coloured sequins. It is attached in the middle at the back to a hat (Kalaw). These earrings (Gowara Baband) string attached to hat and shawl on sides of head – to take the weight, made of gold. The bracelets (Bazani kurdi) are worn by all women in Kurdistan and can be either silver or gold. Mukarian area in east Kurdistan.